Brooke took us from a bad situation to a manageable one. Kudos for teaching us how to move from anger and bitterness towards a viable and happier future. Caring about the health and happiness of your children, Brooke Deratany Goldfarb has practiced in multiple areas of the law, from a large firm mergers & acquisitions attorney to a small private criminal defense practice. She created Peaceful Beach in 2008 in order to guide couples and families through the divorce process in a more dignified manner; create more opportunities for individuals and families to resolve conflict without litigation; and help people in general move forward in positive, productive, and healthy ways. Brooke is a Florida Supreme Court Certified Family & Circuit Civil Mediator; Qualified Arbitrator & Parenting Coordinator; Divorce Facilitator & Guardian Ad Litem/Child Advocate. She is also a trained in Elder Care Mediation and Shared Family Decision Making. 3. Facilitates communication among adult siblings and other family members and caretakers to resolve issues regarding elderly or deceased parents. 4. Outside the family, Brooke mediates and arbitrates for individuals and small businesses for various civil agreements. 6. Endeavors that all parties are heard, feel respected, and resolve their differences outside of costly and dehumanizing litigation. Free initial 30 minute meeting to discuss process and pricing. 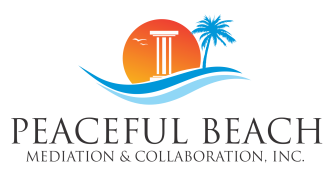 Peaceful Beach Mediation serves clients from throughout Brevard County, including Palm Bay, Melbourne, Melbourne Beach, Indialantic, Indian Harbour Beach, Satellite Beach, Cocoa, Cocoa Beach, Viera, Rockledge, Cape Canaveral and Titusville. Located at 150 Fifth Avenue, Suite E, Indialantic, FL 32903. Entrance to office is upstairs at the back of The Deratany Building (2 story brick building), facing 4th Avenue, west of Skewers. Staircase to office can be seen from the back parking lot of Skewers Restaurant. East and across the street from Bodywise Medspa and Space Coast Credit Union. Large parking lot on the corner of 5th and 4th Avenues and Shannon Ave.